story by Marisa McClellanJanuary is the month for fresh starts. Some people decide to lose weight, others to quit smoking or recycle more. In my house, we’ve decided to be diligent about eating our greens. Thankfully, this doesn’t have to be a chore. Here are three recipes I’ve designed to help all of us play Popeye in delicious ways. Start with a white bean and chard soup that is meaty and filling enough to satisfy the bellies of even the hungriest households. Skip the ham and the dish becomes vegan. (In that case, I’d suggest adding a bit more sea salt and maybe some tiny cooked pasta to help bulk up the flavors). Next up is a more modern take on the classic collard preparation. This one uses a bit of bacon in place of the traditional ham hock and cooks for just under 30 minutes. These would be incredible alongside a scoop of cheesy grits. 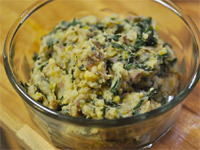 Last up is colcannon, a tempting combination of sautéed leeks and kale, stirred into mashed potatoes. This dish is brilliant because it makes greens appealing to even the most reluctant vegetable eater. Truly, who can resist a helping of mashers? The night before making this soup, put the beans in a large bowl and cover with eight cups of water. The next day, when you’re ready to start cooking, drain the beans and put them in a large soup pot. Add four quarts of fresh water, five peeled whole garlic cloves and the rosemary. Bring the beans to a boil and then reduce the heat to low. Gently simmer the beans until soft. This will take between one and two hours, depending on the size of your beans. While the beans cook, clean the chard, remove the crunchy stems, cut the leaves in half lengthwise and slice them into thin ribbons. Mince the remaining three cloves of garlic. When the beans are soft, increase the heat until the soup is simmering vigorously. Heap the chard ribbons into the pot and stir them into the broth. Add the minced garlic. While the greens cook down, brown the ham cubes in a skillet. When they’ve rendered their fat, use a slotted spoon to add them to the soup. Taste, adding salt and pepper as needed. Serve with crusty bread. Wash the collard greens. Slice out the hard stem, cut the leaves in half lengthwise and then slice into finger-width ribbons. Set aside. Heat a four quart skillet over medium-high heat. Add the bacon and cook until the fat has rendered out and the bacon bits have started to crisp. 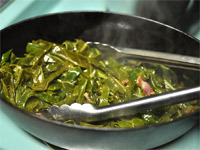 Add the collards and toss with the cooking bacon, coating the greens with the bacon fat. Add the white wine, water and garlic. Put a lid on the skillet and turn the heat down to medium. Cook covered for 15 minutes, until the greens have turned from vivid green to something more muted. Remove lid and cook for another seven to eight minutes, allowing the liquid to reduce a bit. Season the greens with three to four grinds of a pepper grinder and taste. The bacon should have lent the greens plenty of saltiness, but feel free to add a couple pinches, if necessary. Cut the potatoes into uniform pieces and boil until soft. While the potatoes cook, halve and clean the leeks. Cut into slim half moons. Wash kale and chop into inch-wide ribbons. Heat a medium skillet over high heat. Add the olive oil and leeks. Let leeks brown for two to three minutes and then add kale. Cook until the kale is thoroughly wilted. When potatoes are soft, drain and return them to the pot. Add butter and milk, and roughly mash. Add the cooked kale-and-leek combo, as well as the salt and pepper. Stir to combine.